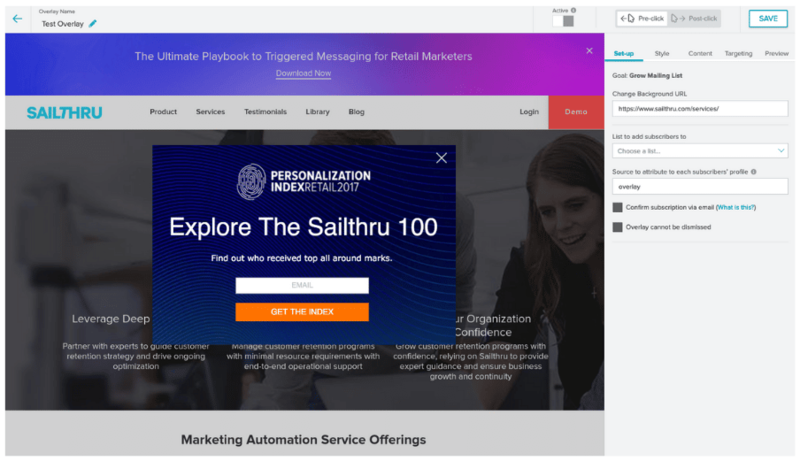 With Sailthru’s Overlays, engage site visitors with targeted messaging as they browse. Create Overlays on your site with an easy-to-use interface in My Sailthru. Display user signup forms, special offers, and more–each as a modal window or a bar at the top of the page. 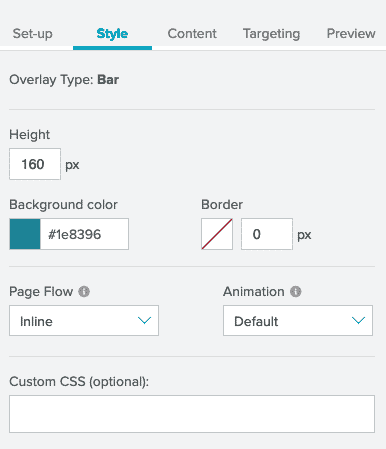 Overlays require Site Personalization Manager (SPM). If you do not see the SPM menu at the top of My Sailthru, please contact us to inquire about adding these features. Overlays also require that the latest Sailthru JS is embedded on your site. Each overlay can be displayed as a modal window or a top bar that the user can close or interact with, for example, by entering information and clicking a “submit” button. Promote Something (Announcement) – A simple message without any interactive elements. 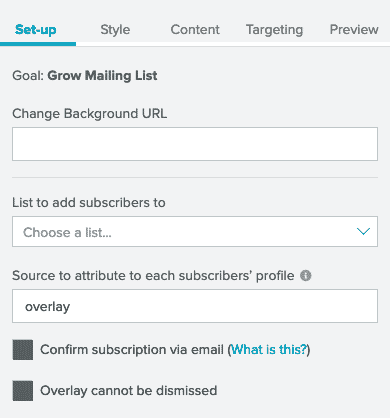 Grow Mailing List (User Signup) – Include a form for the user to enter their email address. Name – Internal name you have set for the overlay. Click to view or edit its settings. Status – Active or inactive. Schedule – The start and end time for the display of the overlay, or “Indefinite”. Note: An Overlay must also be active in order to be displayed, regardless of schedule time. Even if currently scheduled, an inactive Overlay will not display. Goal – The type of challenge to solve for with the overlay: Announcement or User Signup. Audience – The targeted users: Lists, Anonymous, Known, or All users. Views – Number of times the overlay was displayed. Click Rate – The number of clicks on a link within the Overlay, inclusive of anything that is marked up with an anchor tag set . This excludes any clicks on the X to close the Overlay or on the Submit button. Conversion Rate – The number of conversions divided by views. Conversions are currently only available in User Signup Overlays. Click an image to select either bar or modal for the type of Overlay you want to create. The Overlay Builder opens. On the Overlays page, when you click New Overlay or click the name of an existing overlay, the Overlay Builder opens. The Top Bar displays the editable Overlay Name and Status (Active or Inactive), its Last Saved Date/Time, and a Save button to commit your changes. 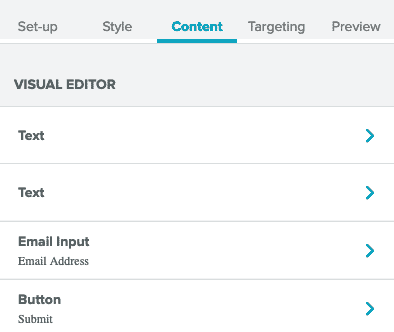 Pre-click and Post-click options are available for the Email Signup modal and bar Overlays. Post-click shows your selected Display Message. The Side Bar offers the tools for creating and editing your overlay, with five tabs: Setup, Style, Content, Targeting, Preview. Note that different options may be displayed on each tab depending on the type of overlay you have selected. 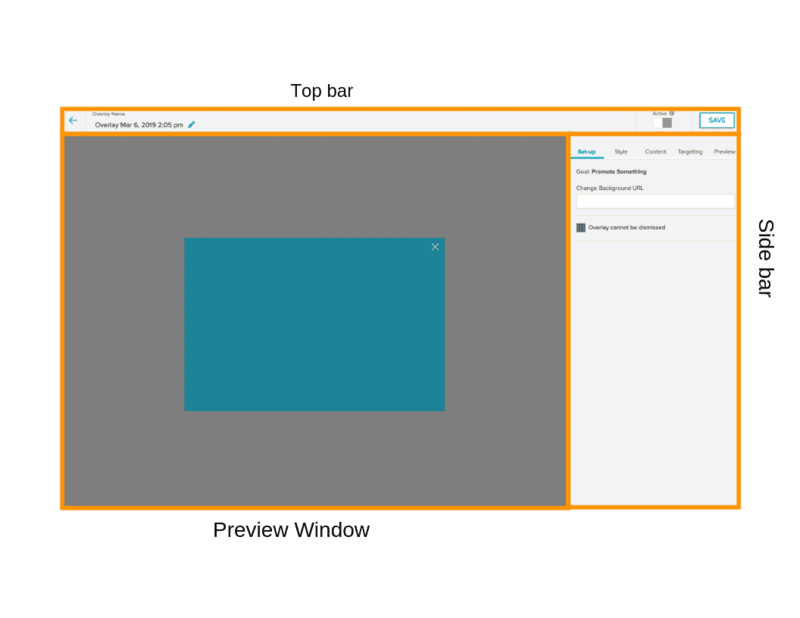 Setup – Set the background preview URL and Overlay dismissal option. Setup options vary depending on the type of Overlay you’re creating. Style – Set the overlay position, color, optional image, and background opacity. Options vary depending on the Overlay type you’re creating. Content – Enter the overlay content. Content options vary depending on the Overlay type you’re creating. 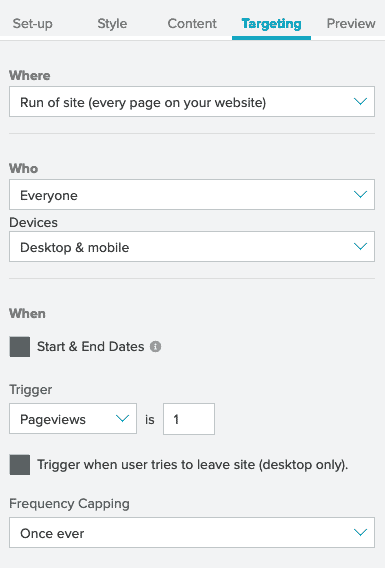 Targeting – Select which pages, users, or user activity should launch the overlay, with an optional frequency and time period. The Preview pane shows the current appearance of your overlay against the URL you set as the background. Set the preview URL in the Setup tab Change Background URL dialog box. For more information about any of the individual settings within the builder, see Overlay Settings, below. Confirm subscription via email If enabled, the selected Confirmed Opt-In template is sent and the user is not added to the list until they click the link you have provided in the email. If disabled, the user is added to the Destination Lists immediately upon their submission of their email address, and the sailthru_hid cookie is set to identify the user for current and future browsing sessions. Using confirmed opt-in can cut down on the number of bot sign-ups. A user clicks to sign up from your Overlay. Sailthru creates an array called “signup_lists”. Automatically pipe the array into the signup_confirm() function. The function is contained in the link you send in your signup confirmation template. When the user clicks the link in the confirmation email, Sailthru adds them to the selected lists. The user is redirected to a confirmation page. To use a custom page instead of your default Thank You page, create an “Other”-type Hosted page named “signup-confirm”. Note: The type “Other” and the name “signup-confirm” are required to access and edit the signup confirmation page. Modal – Overlay is displayed as a pop-up in your page (in the same browser window as your page). Bar – Overlay is displayed as a bar located at the top of your page. Background Color The background color for your overlay. Use the color-picker tools, or manually enter a 6-character HTML hex code or set of R/G/B color values. Manually entering either of these is recommended if you are attempting to match your brand’s color. Background Image You can use this feature to upload an image to display in the overlay. The image can be displayed above, below, or alongside text, or as a background image. Note: It is also possible to display an inline image that is instead hosted on your site or elsewhere by embedding it with your own custom HTML. Click “upload image” and select an image from your computer. Behind other content. When this option is selected, additional Background Image Options are displayed. 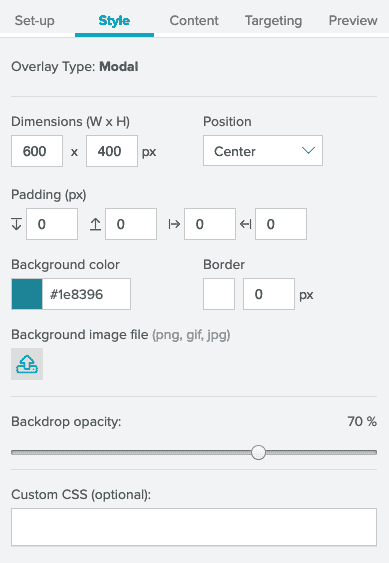 Fit – Resizes the image to fit inside the overlay, maintaining the image’s aspect ratio. Will cause letterboxing (background color to appear) above or beside the image if it does not match the overlay’s aspect ratio. Fill – Resizes the image to fit the width or height of the overlay-matching whichever side of the image is short of the overlay’s aspect ratio-so that there is no letterboxing and may be some cropping. Tile – Orients the image at the top-left of the overlay. Repeats image if it is smaller than the overlay. Maintains the image’s original size and aspect ratio. Center – Preserves image’s original size and aspect ratio. Cropping will occur if the image is larger than the overlay. Note: Safari does not support changing text alignment of drop-down elements (<select>). They will always be left aligned. 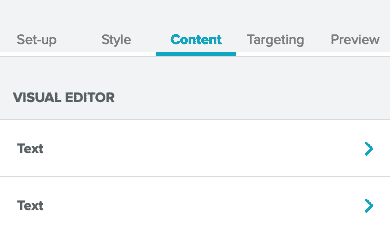 Button Select a button color, enter button copy text, and configure a Post-Click Action. For the Post-Click Action, you may either enter a message to display or a URL to which the user will be redirected. If you enter a message, after the user submits their email address, the message is displayed for 5 seconds before the overlay is automatically closed. Where You can select to display the overlay “Sitewide” or only on “Specific Page(s)”. When you select “Specific Page(s)”, additional options are displayed for selecting those pages. Once per visit – Once per site session. A session is is considered to have ended when the user’s last pageview occurred more than 30 minutes ago. Start Date – The date to begin displaying an active Overlay. When blank, the Overlay will display as soon as it is set to Active. End Date – The date to stop displaying an Overlay. When blank, the Overlay will continue running until it is set to Inactive. Simple Enter a URL and Sailthru will disregard any query string and protocol, matching only those URLs that contain the same domain and path or file extension. Exact Matches the entered URL exactly. Trailing slashes will be ignored. 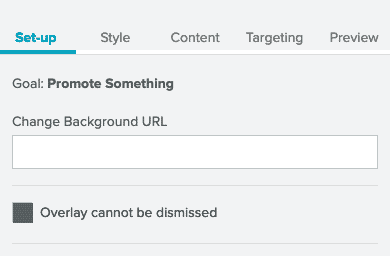 You can use a special query parameter in your site’s URLs to view any overlay for testing purposes, regardless of its status (active or inactive) and targeting rules. Stats are not counted for this feature. Add form elements to your Overlays to collect and record user information that’s relevant to your marketing efforts. Any information you captured in a standard form you can now capture through your Overlays. Segment, target, and message your users more effectively with additional information. data-var-name Specifies the name of the var to populate. Any valid profile var name. data-var-attribute Specifies the name of the element attribute that contains the var value. Any valid HTML element attribute name. The option name must match the data-var-name. In this example, the data-var-name is gender, which is matched by the input element’s name. This can happen at user conversion or at any time.